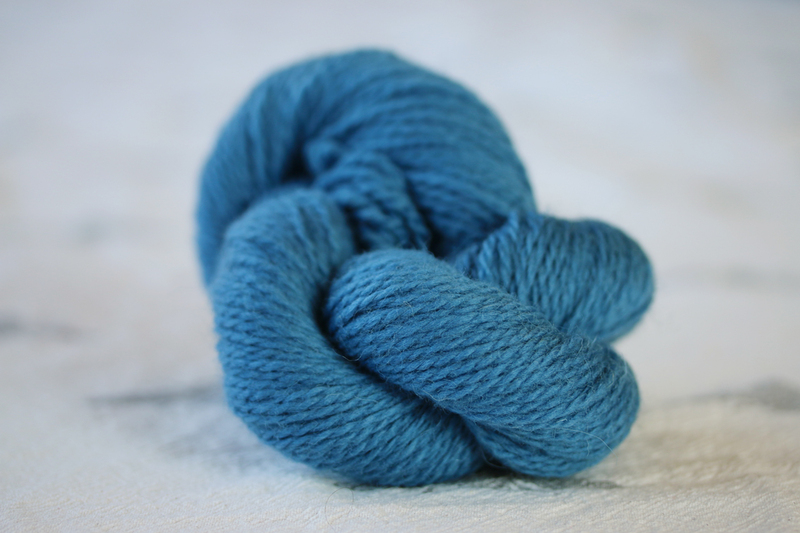 I had some knowledge of most of the manufacturing processes that making my yarn involved, but the process I probably knew least about was dyeing. Like most designers, I love colour, and I am very picky about the shades I use being just right. I had a very clear idea in my head about what I wanted my highland coo shade to look like, but very little idea about how that shade might be translated into a dyed yarn for hand-knitting. Tom and I suggested to Adam that we’d very much like to observe the dyeing process from start to finish and thanks to him, and our wonderful dyers, Harrison Gardner, we were able to do just that. 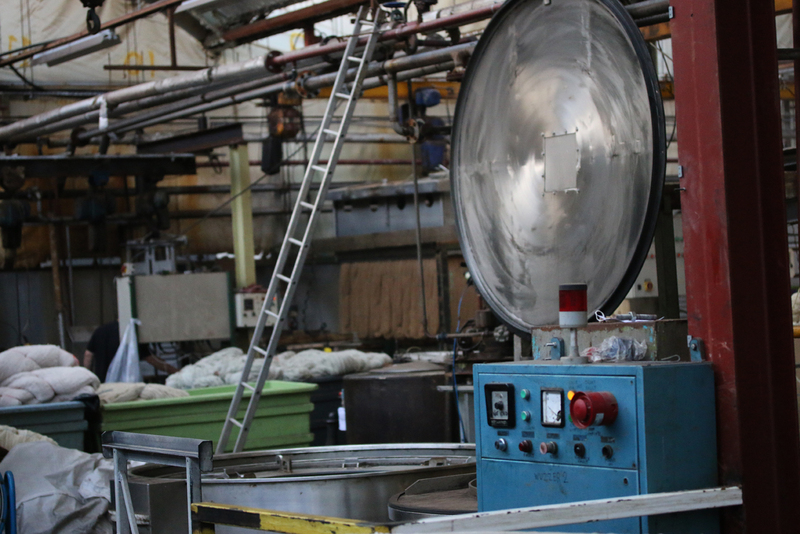 Harrison Gardner are another great Bradford textile company, based a short drive away from Haworth (we are really pleased that all of the processing of our fibre and yarn was done within a small West-Yorkshire radius). 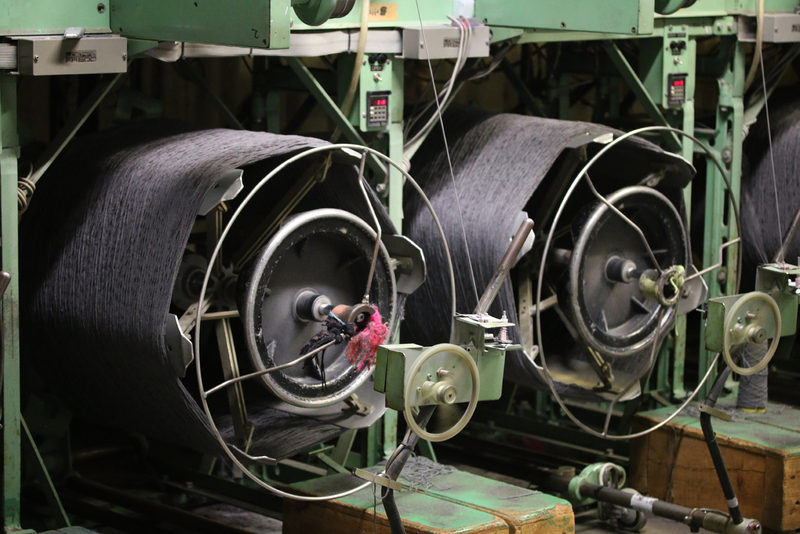 Harrison Gardner are a family company who have been expertly dyeing yarn since 1901. 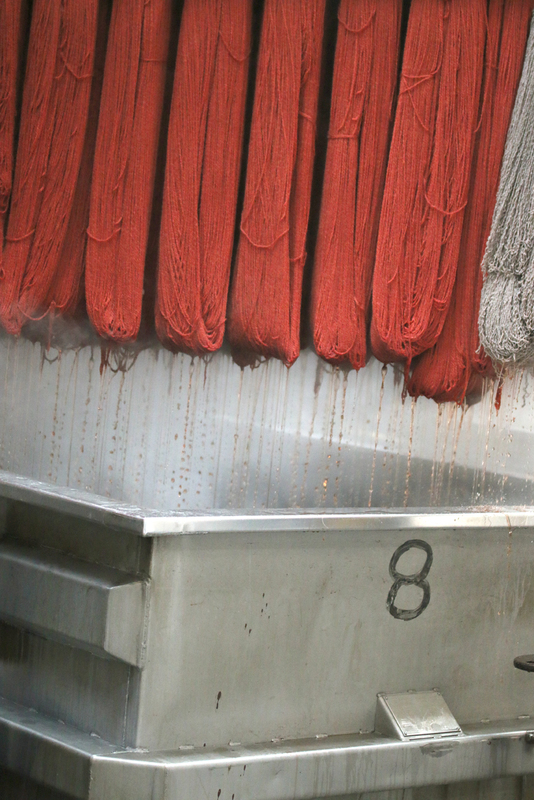 They dye yarn on the hank – a process that is ideal for our requirements, because of the nature of our yarn (high-quality 100% wool), and the consistency of the end result (hank dyeing is in some respects more time consuming and costly, but also allows colour to be absorbed more uniformly than other processes). At Harrison Gardner we met Jonathan Harrison, co-director with his brother, Daniel, and part of the fourth generation of his family running the company. 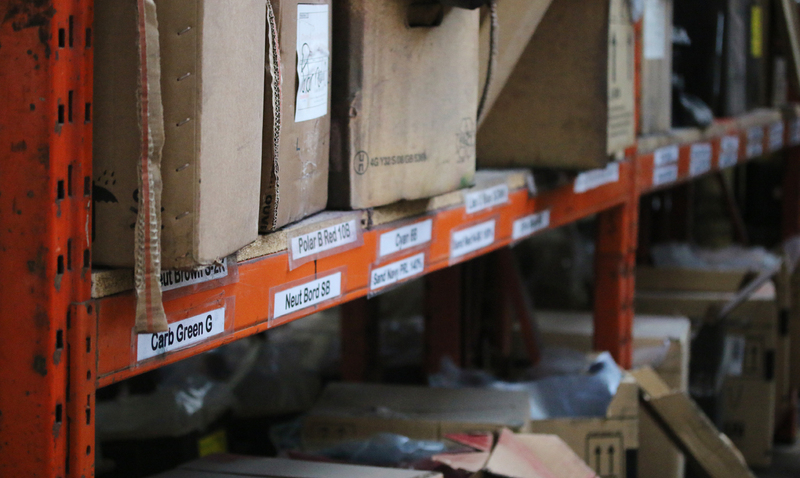 Jonathan is head of production, and has a refreshingly hands-on approach to all of the processes the company’s involved in, including colour matching, which was one of the things I was most interested in seeing. I was able to show Jonathan what I wanted my highland-coo shade to look like, and the dye recipe was created by matching my requirements in an incredible machine. The machine generates dye recipes that can accommodate a fascinating number of customer demands and criteria, including cost, fibre type, and colour consistency across a range of different light conditions. These light conditions include daylight, tungsten light, and a wide variety of other artificial point-of-sale lighting methods commonly used by retailers (including the very particular kind of artificial light that is apparently used by Marks and Spencer). 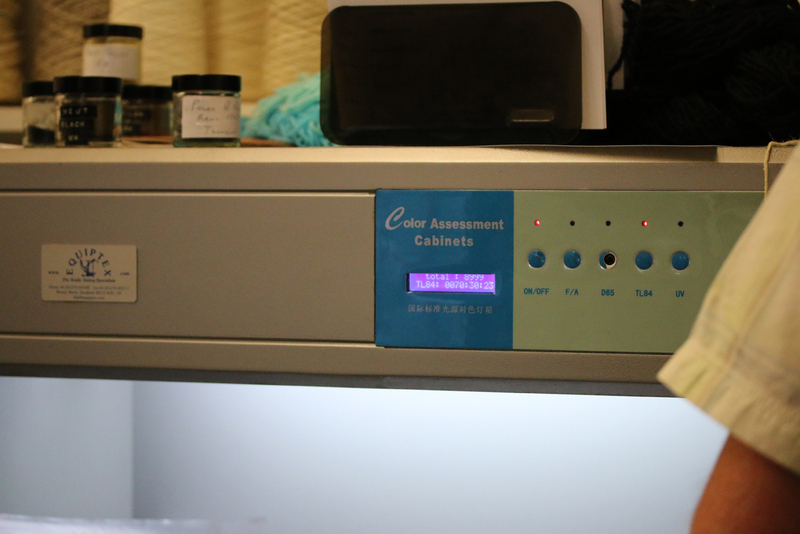 Once a colour recipe is created and agreed on, this is tested on a sample of the customer’s yarn in Harrison-Gardner’s dye lab (a neat operation that closely resembles the indie-dyeing workshops or studios many of you will have seen). Its not just a matter of trusting the colour-testing and recipe-generating methods of the nifty machines – everything is double-checked by eye, and the expert dyers have to be happy with the result. 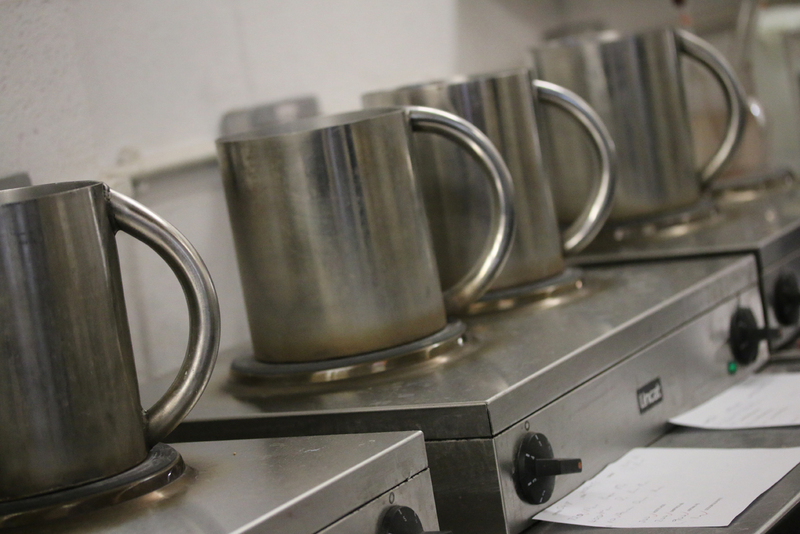 Once they are happy, the recipe is scaled up, and then the fun begins in the large custom-built dye house next door. This is the dye bath in which my highland coo shade was created! 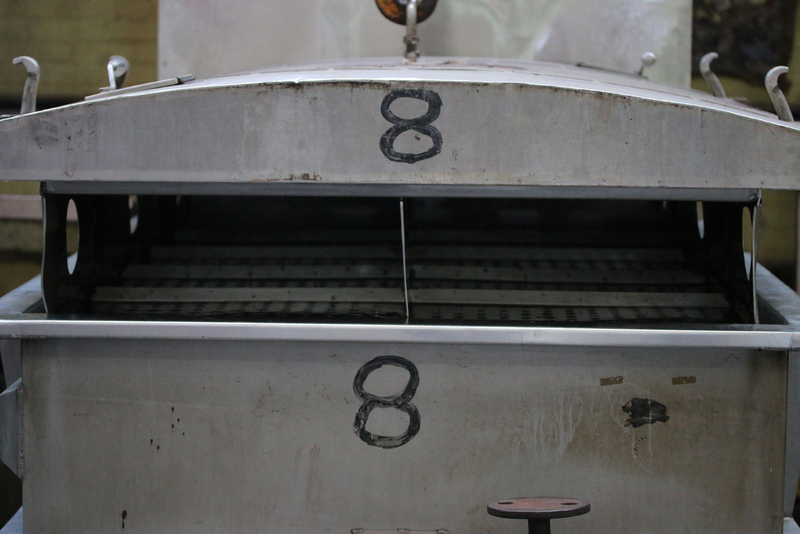 Jonathan explained that they use this particular machine for dyeing quality pure-wool yarns because the action of the wash is comparatively gentle, ensuring that none of the fibres are felted or damaged – even when the temperature in the dye bath is raised to boiling point. My yarn was arranged above the bath in 2 kilo hanks, and prepared for dyeing. Here it is! The brown-y grey skeins that you can see at the end of the bath are there to offer further protection to my yarn against the swooshing and swirling action of the dye-bath. They are there to take up the flack, and ensure the fibre achieves maximum dye absorption with minimum impact. Keith (an expert dyer who has been working with Harrison Gardner for over 30 years) poured a bucket of highland-coo coloured dye solution into the bath, and then the hanks were lowered in . . .
At this point, as you can imagine, we were extremely excited! Jonathan then took us for lunch in the factory canteen, where we were treated to a superb home-cooked steak pie and peas which we ate outside in the sunshine. 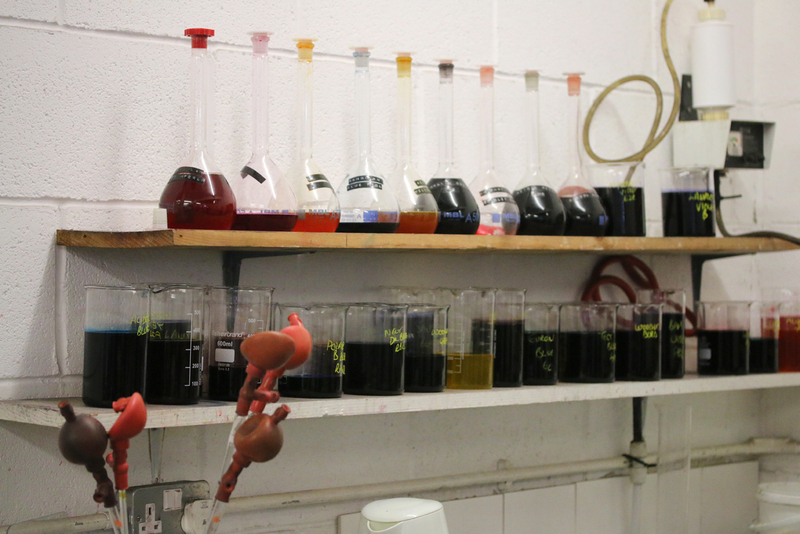 After a very pleasant lunch, we were able to return to the dye bath to see how things were doing. Here comes the highland coo! I liked the result, but I did feel that it needed the tiniest amount of adjusting to look completely like the rich and rusty coo-like shade I’d pictured. Jonathan agreed, more dyes were added to the bath, and the yarn went through the process again. This time the shade was absolutely perfect! 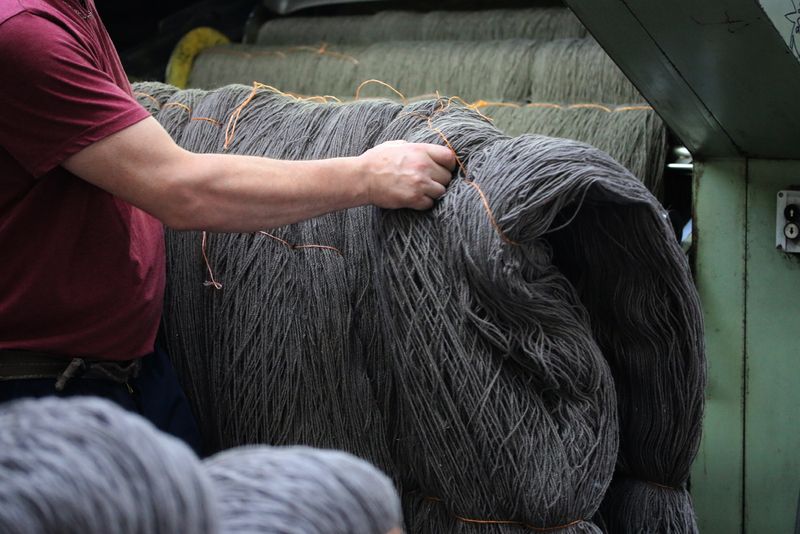 After dyeing is complete, the yarn hanks are dried – first in a sort of giant spin dryer . . .
. . . and afterwards in a specialised hank dryer. 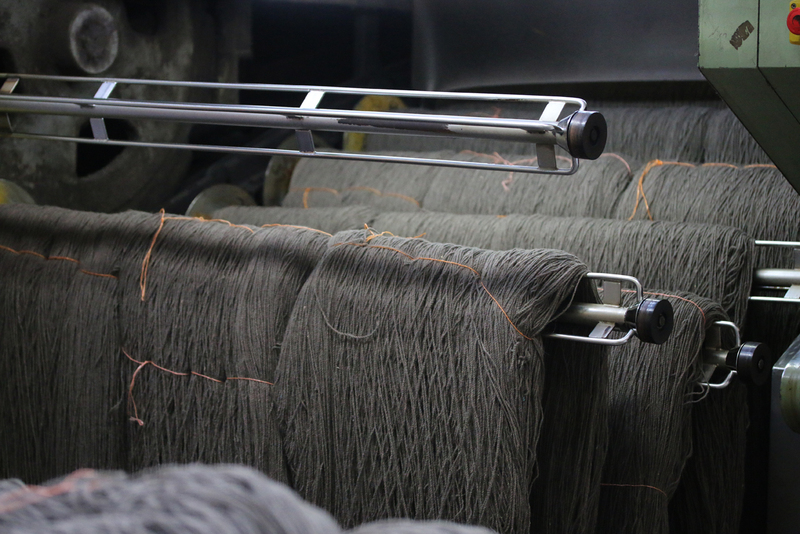 I was particularly intrigued by the hank-dryer and its effect on the yarn we saw going through it . . .
. . .which was noticeably loftier and poofier when it came out than when it went in. Jonathan explained that this loftiness is a very important factor for yarns used in the carpet industry (of which they dye many), as well as yarns for hand knitting. When you see my yarn, the dyed shades have, I think, a slightly poofier handle than the undyed shades – this is a pleasing and natural effect of the hank drying process, and everything evens up in the blocking. Finally, the dried yarn is wound onto cones . . .
. . . and sent a few miles down the road to the skeiners. Now for the moment of truth: a finished skein of highland coo! We had a fascinating day at Harrison Gardner, and we were really impressed with the commitment and interest of the lovely staff, and indeed with everything with saw. Best of all the dyed shades are exactly what I’d dreamt they’d be. It is a truly amazing feeling seeing the colours you’ve pictured in your head imagine become a woolly reality! Thankyou so much for taking the time to show us the whole process, Jonathan! Tom is still dreaming about that steak pie . 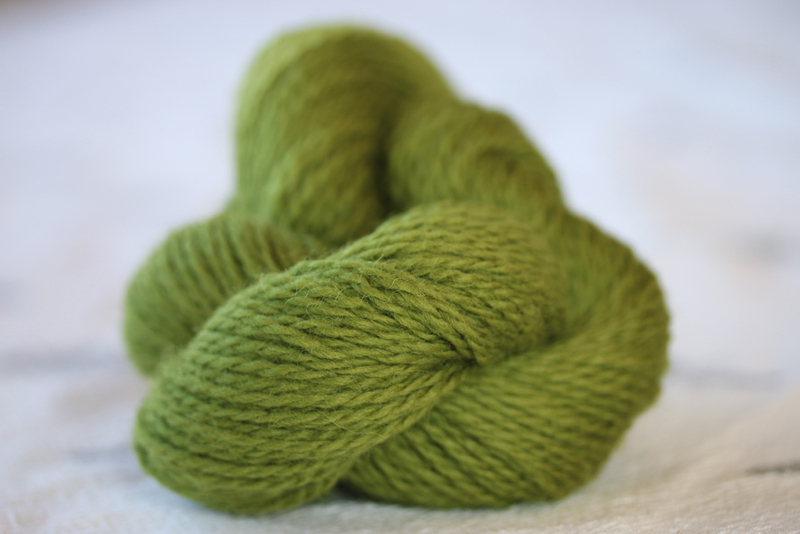 . .
Sign up for our Buachaille newsletter to be the first to hear about the yarn’s release! Such beautiful colours, and the yarn looks gorgeous. Like everyone else, I can’t wait to have it in my hands! The ‘incredible machine’ sounds *amazing*. What a lovely and interesting post; thank you for showing so much of the process ! The yarns all look stunning, really wonderfull. this has been fascinating to watch . I have had two years of not buying yarn (using up my stash ) but I fear that drought may be coming to an end ! that yaffle has me written all over it!! What a fascinating process, and such an exciting venture for you, Kate. I am so looking forward to seeing the designs you have for this yarn. The colours are wonderful. That was so interesting! Since I started following your blog I have learned so much from you – gorgeous patterns, history, and now this. I almost feel like part of your family with everything that you share with us. It’s going to be a race which yarn I get first. 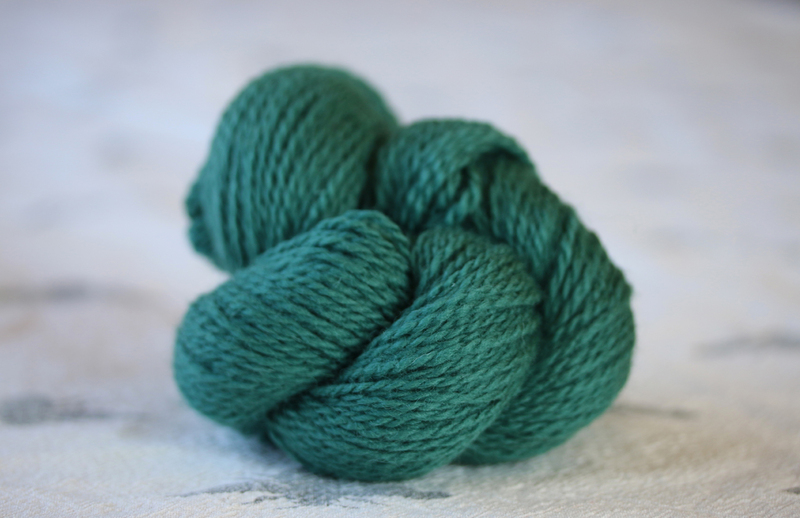 Waiting for my yarn from Juniper Farms and the Buachaille – so exciting! magnifique, superbe, que dire de plus ? on voudrait acheter toutes les couleurs. Vraiment bon et beau travail de vous tous. Okay, so are you satisfied – I’m drooling over the beautiful old desklet I acquired for a song at Tim’s Resusables. But your colours make me feel so happy, I don’t care. Well done Kate and Co.
I’m giving the Highland Coo a great big MOOO!! The colors are really beautiful so far. I’m curious that the grey-brown skeins hung at the end didn’t seem to take up any dye. How does THAT work?! Also, what does “flack” mean in this context? What you say about light sources implies that it’s possible to dye something that’s the same color (or close to) in many light sources. How cool is that! Gorgeous colours. 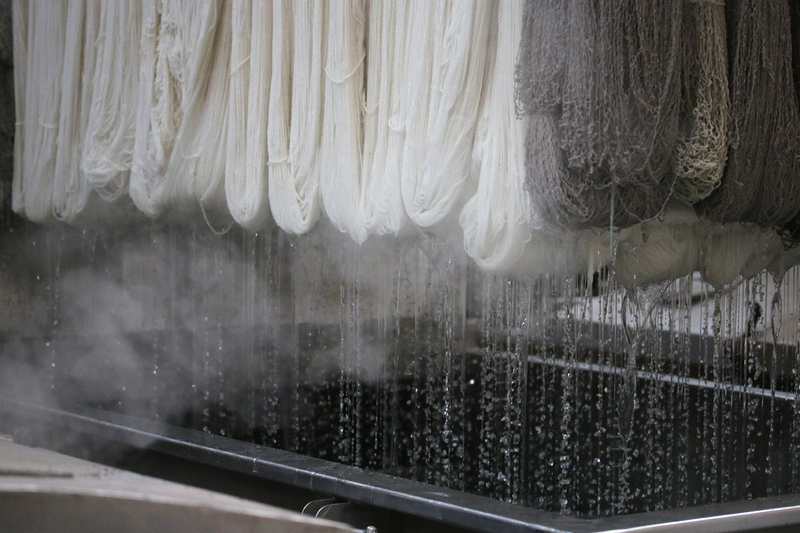 Fascinating process for the dying of the fibres. Thank you for sharing the process of dying the fiber,Such an amazing experience to be able to adjust to the perfect shade. They all are so gorgeous I cannot wait to purchase them. I love how you walk us through every single step of the process! I feel like I already “know” this yarn! I live in the Pacific Northwest and I am afraid I’ll miss out on the first release because of the time difference — please save some yarn/kits for North America! 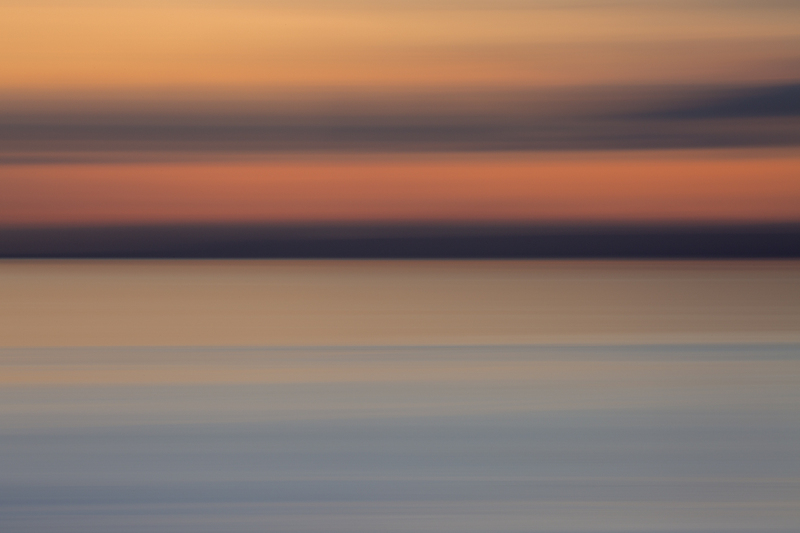 :)) Your colors are simply beautiful! I love being a witness to the process, thank you so much. I can’t wait for the release! Your descriptions of each step inspired me for a new career. The colours are amazing, Kate. How very exciting……it’s so close! The colours look fantastic! I would love to use some for Naalbinding. I’m sure the wool would be very suitable for making warm hats and gloves. Oh my, but the excitement is building! I am checking my email many times a day, and I have no problem getting up early to check! I even woke up last night muttering the names of the yarn. Sheesh. I must have been dreaming about them. Thanks for the wonderful stories about the process — I have done a bit of dying, so I really appreciate this post. I am so looking forward to knitting with this yarn! Thank you for sharing the process with us. 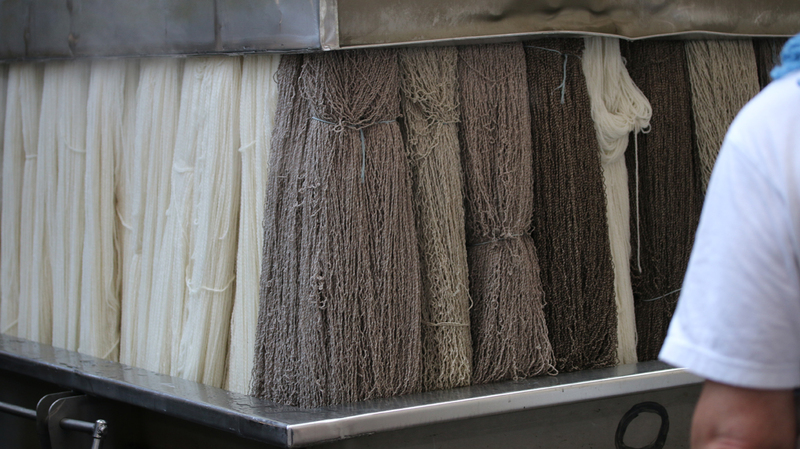 I do some of my own wool processing and dyeing, so it is really interesting to see how it is done in the industry. Katie, please save skeins of all the colours for us Canadian Knitters … the time change could effect our purchases with the UK time! I can hardly wait to order your yarn! 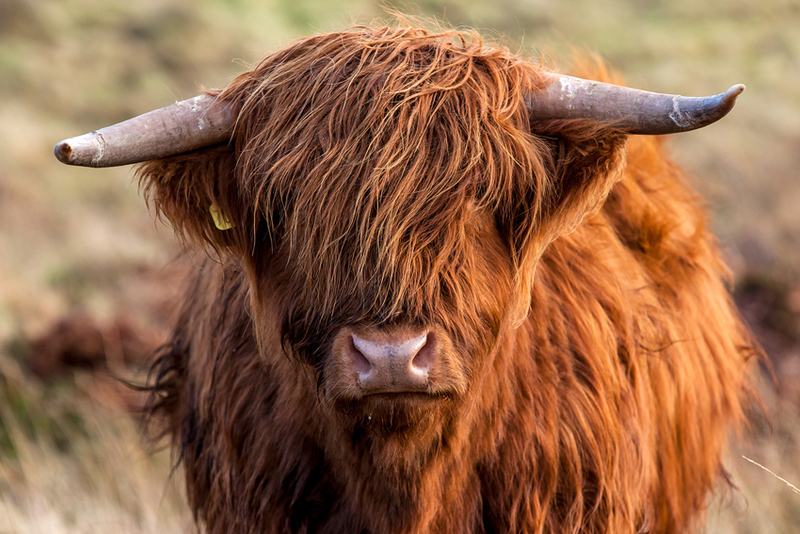 The story and video were great and the Highland Coo color is beautiful, but – not really the color of the coo. My hair used to be highland coo color (no longer sadly) and not the color of the yarn. Merci de partager tout ce processus de fabrication. C’est magnifique ! Wow, loved the peek inside the dyeing process but OMG, those colors – I can’t wait until the yarn is released! Absolutely delicious colour shades.All ,,,,My new favourites, I am chomping at the bit and feeling a little selfish knitting in definitely in order, I already know your kit won’t let me down !! !,,,,,,so excited,,,feel like a kid again waiting for Christmas. I’ve done hand-dyeing before, so it was especially fascinating to me to see the industrial process. Love all the colors, too. Especially Highland Coo! wonderful colours, Kate, and the finished yarn is so deliciously crimpy. It’s asking to be knitted (by me). 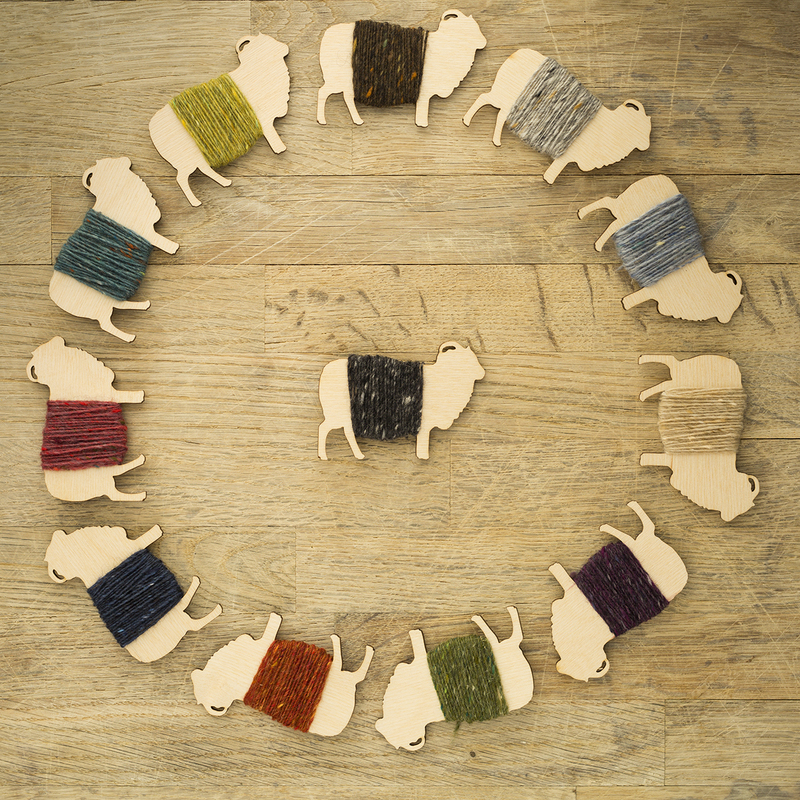 Can’t wait to see the special project you have lined up for us but I hope you’ve made plenty of wool …. Ces couleurs sont splendides,il me tarde de tricoter un pull ou une veste. Love the Highland Coo, any chance of a sock weight version. My son is very keen on Highland cows and I’d love to make him a pair of Coo socks. So enjoyed this post! What an absolute thrill for you to be able to see your creative imaginings come to life. The yarn colors are beautiful! I hope to visit Scotland in 2016 to investigate some ancestry in Prestonpans. Any chance of meeting you in the flesh? Thank you for sharing the process! Colours are so beautifull all my favorites. I cannot wait! The Highland Coo just mooooooos me. 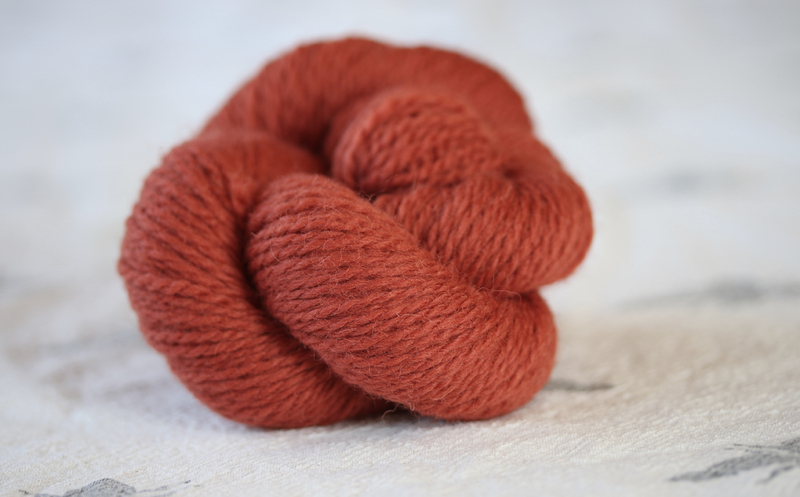 Wonderful post for me who has spent many hours dyeing wool over a wood stove! I guess it’s the same process, but so much more exact and sophisticated. The final colours are scrumptious. So glad to hear that you’re going to be packaging up a little of each color in kits for the first go-around. As someone above said, we’ll all be camped out in line, waiting. Thanks for letting us follow the yarn’s travels from sheep to needles. This is fascinating. Thank you for sharing all the processes of creating your yarn. Thank you for sharing the details about the process of developing your unique yarn from sheep to skein. I am very “colour-specific” as well and reading about this process to colour the yarn really engages the 6-7 million cones found in my eyes. 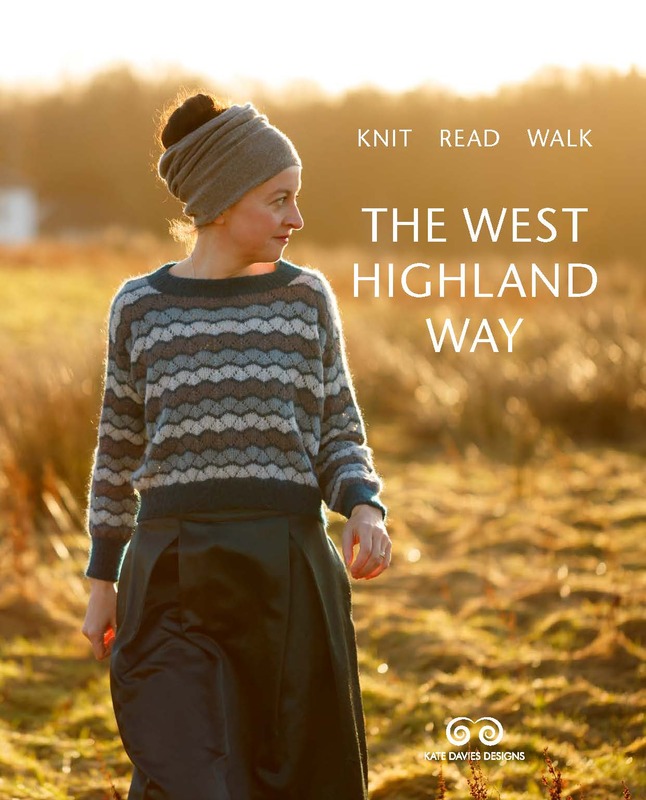 I love the colours you have created, the Highland scene from which each is derived and I dream about having this wonderful yarn in my hands at some future date. I can hardly wait!! These are so gorgeous! And I live on Whidbey Island, Washington, US and so want to hold a skein of this yarn in my hands! I got so excited for you watching the video clip! The colours are gorgeous! I love your new yarn and the wonderful colours. Please could you let me know about availability in Canada as I live in Calgary, Alberta and would love to be able to purchase some. Hi Doris, we will be selling the yarn directly to customers at first – and will certainly be happy to ship it to Canada!. We are intending to introduce a flat shipping rate, which will mean that shipping costs the same, wherever in the world you are. You’ve tapped in on the basic thirst in this digital age that most crafters understand, and the world seems to be missing; a direct link to the natural world, a story into which you can place yourself as part of the process when you take the product and create your own vision, then pass the love of that to someone else. It’s elemental and we need this more than ever today. Lovely! I am just enthralled with the process, thanks for sharing! Kate I think you need to think about how many kits you need to have. Then quadruple it!!! I don’t want to be one of the disappointed customers. Exciting and fascinating! Hope there will be even more photos and video to come…..as well as the lovely yarn! It’s been fascinating getting an insight into all these processes! Thank you so much for sharing it. They are such lovely colours. I had thought I would be most tempted by Islay, but a combination of Highland Coo, Between Weathers and Ptarmigan is tempting, but maybe a bit of Yaffle too…decisions! They are all colours that I feel I could wear as well. Sometimes when I see the lovely mustard yellows around I get a bit despondent at how dire I would look in them, although socks or gloves perhaps! I’ve so enjoyed this series on how your yarn is created. Really fascinating. When might we see some of your designs for this yarn? I’m very curious how you’re going to pair all those lovely colors together. Fascinating. Thanks for continuing our education and enhancing our appreciation of your yarns. Thank you for shareing It has been so fun to see this process on a much larger scale than my little spinning studio. I wish I could give my students all these recent articles so that they can see the whole process. It was most interesting especially this final dyeing process. I teach dyeing in a crockpot. So interesting what it looks like on a huge scale. I feel very in touch with this yarn. I’ve been following this with great interest…if you ever decide to offer these wonderful looking yarns, and with such a deep storyline, in the US, my LYS would be first on line. Like for a rock concert, the night before, camped out! What weight will the yarn be? It looks glorious! Much appreciated watching your entire process. You must be excited to see the results of your research and hard work. Thank you for informational blog. Now cannot wait to have some of the wool to knit with myself. Congratulations! They are beautiful! What an intriguing process ~ Lucky you!! I.can’t.wait. Gail, this is pretty much what we have planned for the first release. Watch this space! Your colors are absolutely gorgeous. Can’t wait to see your plans for using them. Goodness *rubs hands with glee* how exciting. I shall join the queue! These colours are luminous but not too vivid or rich… A yarn that has its colours formulated in this country for OUR light! I am delighted and am holding off knitting my second ever cardigan for myself until I can use your beautiful thoughtful yarn… Just have to choose a colour- that ethereal cloud-pale grey is second on the list after Islay I think…. I think you have done a really grand job and many people will be so glad to use such a wool. (Can I say wool or is yarn the correct word!? It IS wool…) Bravo. I really love that all of this happened, not only all in the UK, but in a relatively small geographic region. It’s fantastic that so many skills are being preserved. As for the transformation of the yarn, I can only say that as a spinner, the most exciting part of making my own yarn is the stage when the yarn comes off the spindle or wheel and is washed and dried. The way the twist relaxes, opens up, and takes on air, is total magic. Beautiful colors! Thank you for sharing this amazing process. I can’t wait to knit with this yarn! Such a learning curve for you, so many fascinating details, so very different from the career you set out to do when you were younger! 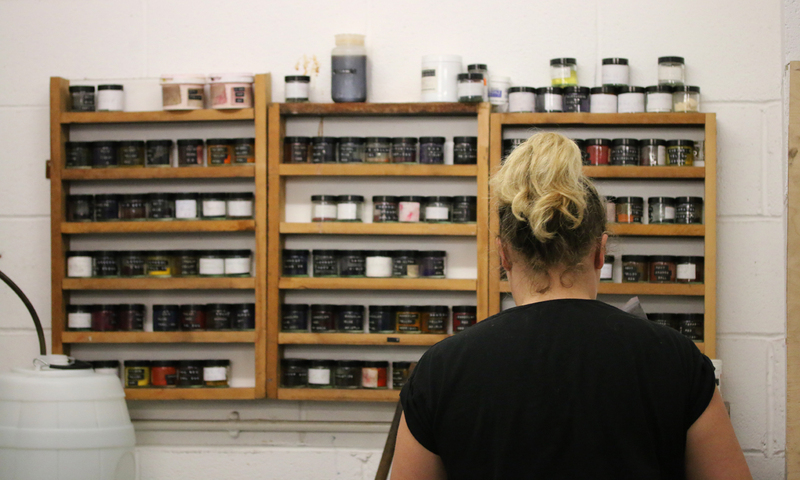 What a fascinating process…to produce some of my favourite colours! Can’t watch the video, though – youtube says it’s private. and on the second try, the video worked. So all fine! Lovely! Thank you for walking us through this fascinating process!